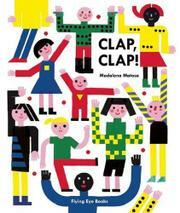 A truly toddler-friendly pairing of clapping and counting. Portuguese illustrator Matoso (Where Do We Go When We Disappear?, 2013) cleverly leverages basic book design into an ongoing invitation to interactive responses, reminiscent of Hervé Tullet’s Press Here (2011). On each spread she artfully places one or more stylized figures—usually pink- but occasionally black-skinned people—so that bringing the covers together creates an action: an open-armed musician centered on the gutter, for instance, crashes cymbals together; two opposing faces kiss; passers-by exchange high-fives; a panini press closes on an arrangement of cheese and veggies. Each action comes with a numeral and the equivalent number of sound effects, from “Mwah Mwah” for the smoochers to an accordion player’s eight times repeated “Fomfim” and a weightlifter’s 12 labored “FFF”s. Actual hand clapping doesn’t come in until the final “15” offers a trio with palms held up and open. Younger children will immediately and delightedly key in to the percussive possibilities, though the volume has uniformly cut edges and rounded corners with no provision for keeping the same place inside while repeatedly clapping the covers together.